of July! Had you going there for a minute, didn't I! It's just amazing to me that over half the year is gone. Other times I keep thinking that it's the end of August and September is rolling around--that's so scary that sometimes I have to go lie down for a bit until the dizziness stops. And, yes, my nose is still to the grindstone. I lack one fabric to finish fabric selection for the new hand piecing series. Then it's on to sewing like mad. Okay, I'm just rambling tonight. You are probably reading this as blah, blah, blah, blah. So, enough already. Sleep like you haven't a care in the world. P.S. I am listening to Kill the Messenger by Tami Hoag and reading Riding Shotgun by Rita Mae Brown. I decided to skip the pictures tonight, but wanted to give you an update on what I've been up to. On the applique front, I've designed three new patterns to complement another design I've had for a while but never done much with. All four can be used in any combination. When the samples are done I will share more. 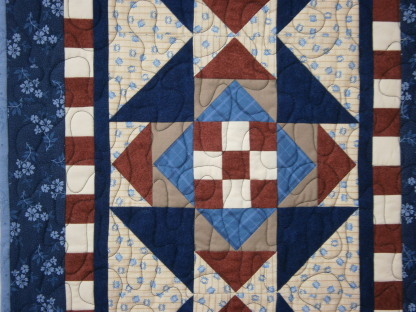 On the hand piecing front, I have a new Monthly Bliss coming up. Eighteen new blocks have been chosen, and I am now deciding on fabrics. On the lawn front--there really isn't much lawn left. Hot, dry weather yields weeds and not much grass. 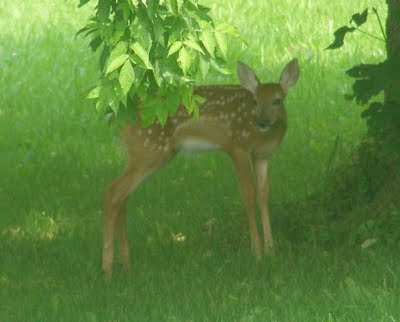 So no mowing for several weeks. 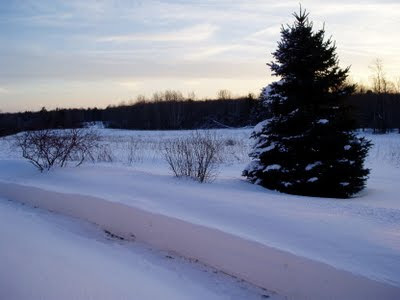 But I had to have a bit of digging done (with a Bobcat) and am now in the process of raking and shoveling. And picking rocks. I'm wondering if I can restart the Pet Rock craze from, I think, the 1980s? I have everything from tiny to boulder. We've had a brief break in the weather--cooler nights that make sleeping so much better. Here's Sharon G's bright and beautiful quilt--the top row, anyway! Oranges, and blues with a setting fabric that is light and airy and perfectly complements the applique. Fabulous, Sharon! Judy D. used a variety of reds and greens with blue vases for her masterpiece. 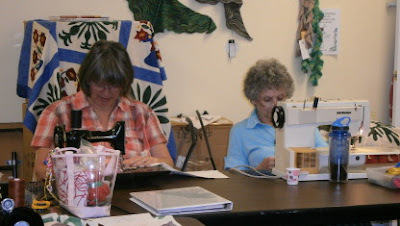 Judy is new to applique and took this class with her friend, Susan, who couldn't attend the setting class because her daughter was sick. We missed you, Susan. 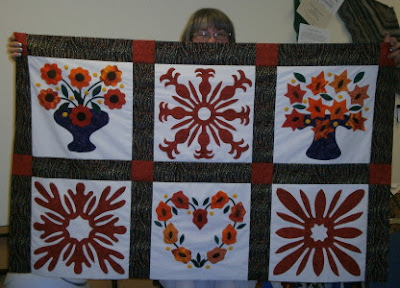 But Judy did a wonderful job and is now considering adding a large border to perfectly frame this beauty. Great job, Judy! Beth was one seam from having her top all together when she ran out of bobbin thread! So she decided to call it a day. Her choice of corals and cool greens gave an entirely different feel to this quilt. Meticulous work, great fabrics--that's Beth to a tee! Judy E. also chose an unusual palette that was very successful. The brown sashing helped carry through what I think of as a very organic, serene feel. A lovely lady...a lovely quilt. You go, Judy! And last, but not least. Gale worked very hard to get her top finished in class. Her background is more of a homespun and her fabric choices were inspired. 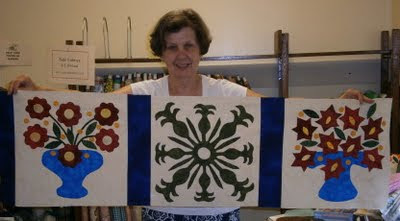 Check out the great batik she used for the cutwork blocks. It added so much interest to those blocks. Fantastic job, Gale! As you can see, this is one talented group of ladies. 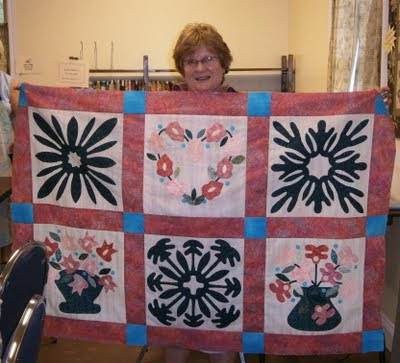 Deb L. finished her top a few weeks ago and is adding an appliqued border around it. When she is a bit further, I will include her picture here. And, in case you wondered, I BEGGED these ladies to show their faces. You can see how much luck I had with that. So most will be known forever more as Kilroy. What a thrill to have spent the last ten months with these women. It was truly my pleasure. 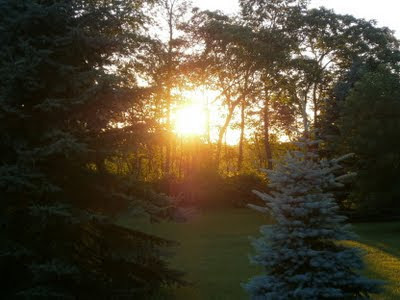 It's a bit cooler tonight, so maybe it will be better sleeping weather. I won't say no to that! 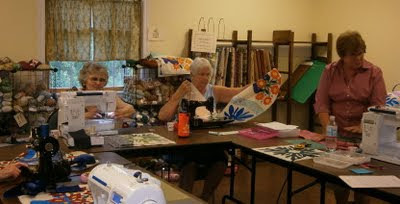 On Thursday, July 21, eight of the In Baltimore Style students met to set their applique blocks. Wait til you see!!!! In the background here you can see my quilt top. 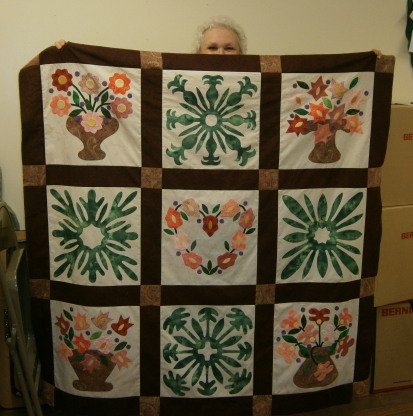 And here is part one of the parade of quilts. Please note that not all the tops are finished, but you can see how wonderful each will be. First, Kathy F.--just look at the vibrant colors she used. 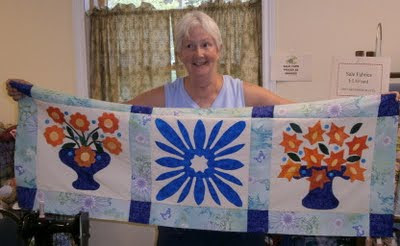 Kathy was a beginning appliquer at the start of this 9 month journey! A few months ago, I was walking through the shop to get to the classroom and I saw a totally awesome fabric on top of the shelves. I fingered it, drooled a bit, but decided I didn't have anything to really do with it. Lo and behold, that same day, we were choosing setting fabrics for Kathy's quilt. It was fate: It was exactly perfect with Kathy's blocks. I just love spending someone else's money! Great job, Kathy! Pat S. chose beautiful reds and blues for her masterpiece. Her tiny circles are done in polka dots, so we chose a different dot for her cornerstones. Isn't it amazing how these blocks are transformed by fabric selection? Pat is a master appliquer--her work is meticulous. And last, for tonight, is Sandy. 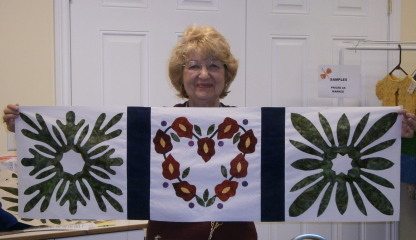 Sandy was also fairly new to applique when she started this class--and she has done a fantastic job. 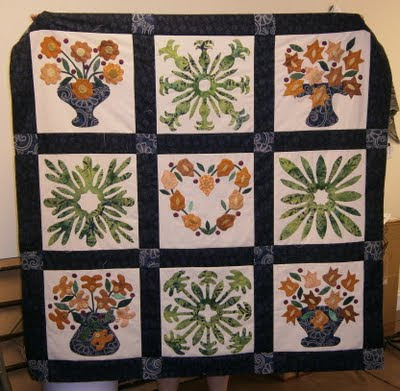 Sandy is setting her blocks with a dark navy and is then going to use a blue and white floral print as the final border. I am so proud! You can't imagine how fulfilling it is to see these blocks come together into tops. All the ladies worked so hard and now they get to reap the benefits of those efforts. Tomorrow you will see.....the rest of the story! You won't be disappointed. P.S. I just finished listening to Borderline by Nevada Barr and am doing A Single Thread by Marie Bostwick next. I'm reading a horse related book. P.P.S. For those of you interested in a great tutorial on backstitch embroidery, please visit Cinderberry Stitches (on the blog list at right). Okay, stick a fork in me--I'm done! These temperatures have roasted me. So I thought I'd give you something to perhaps make you think "cool" or "frosty". I was surprised to find that these pics were taken in February 2004. 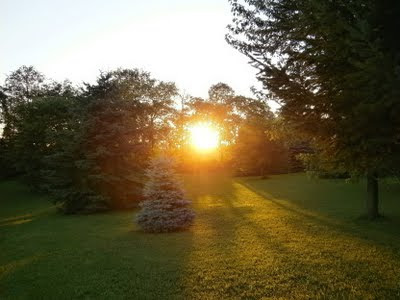 I had to orient myself to decide what direction I was facing when they were taken, as there has been substantial growth of shrubs, trees and the addition of a huge flower bed between where I was standing and the huge spruce tree you see in picture one. And this is facing northwest. 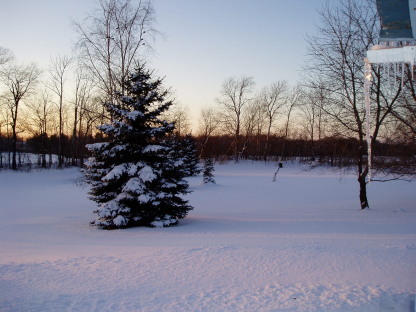 See the stunted birch tree midway between the icicle and the spruce tree? That fell down and was replaced by the ladder and trumpet vine which you have seen in other posts. 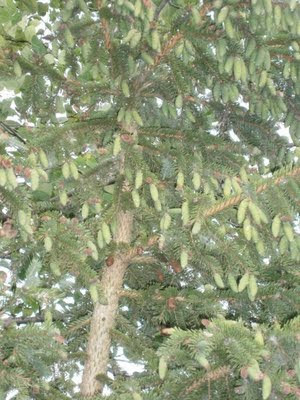 And the spruce tree is giant now. I am just amazed at how much things change when we don't really realize it. 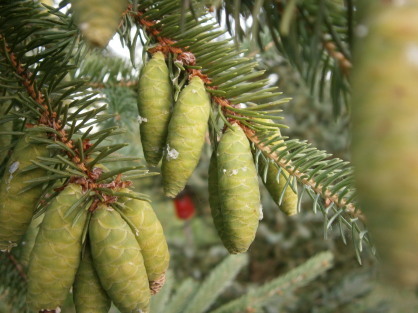 The Year of the Cone? 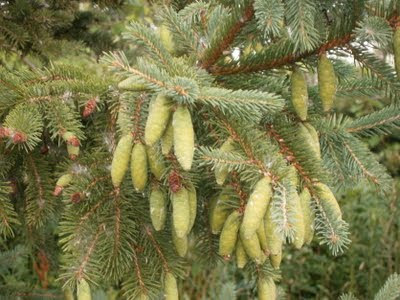 Every few years it seem that the spruce trees are extra full of pine (spruce?) cones. I think this is one of them. This is the view up into just one tree. So tightly closed. 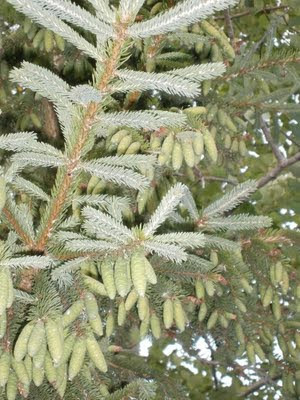 See the whiter bits of sap? Breaking news, Quilt Fans! 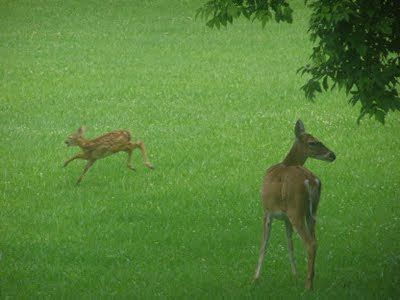 Anita Shackelford has started a blog! Yes, you've heard right! You can click on Quilts and Cuisine on my blog list to the right to hop right on over and take a look. I think you'll really enjoy it. P.S. I am listening to Prior Bad Acts by Tami Hoag. 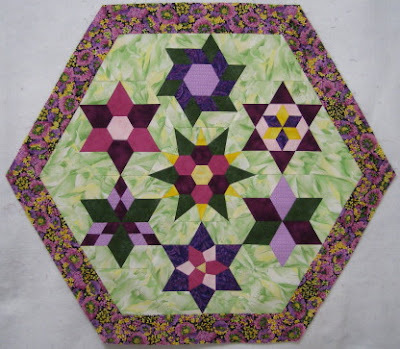 Deb H. took Hexagon Bliss at O'Susannah's Quilt Shop in Watkins Glen, NY. 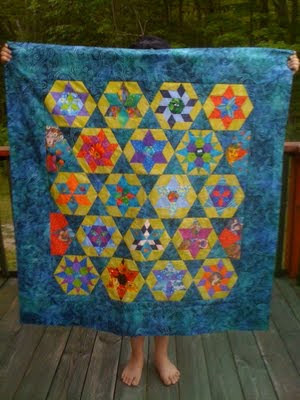 She decided that she did not want a hexagon-shaped quilt and went for the gusto. Hand pieced! Isn't it beautiful? I love the colors in the blocks and the setting fabric brought out the best in them. Check out the half-blocks on the long sides--too cool! See the secondary stars formed by the setting triangles? Deb went forward with her vision. Well done, Deb! You rock! Hot, hot and dry at the Stroud household. Makes me feel like...wait for it..."I'm meeelllllttttiiinnnnggggg!" P.S. I am listening to The Alibi Man by Tami Hoag and reading Smokin' Seventeen by Janet Evanovitch. Both excellent. 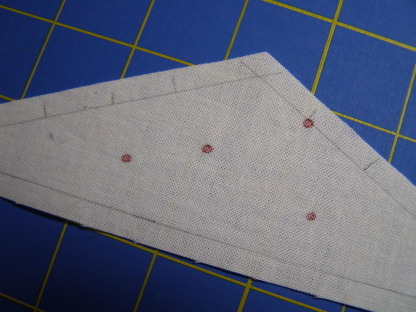 Here it is: A quick tutorial on using spacers for hand piecing. These spacers are 1/2 x about 4-1/2 inches. The 1/2 inch is critical; the length can be to your liking. 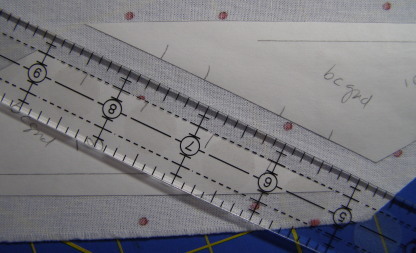 I hand them out in my hand piecing classes so that students can more accurately judge the distance needed between two templates to allow for seam allowances. The spacers are made from card stock--index cards work great and come in wonderful colors. Lay out two freezer paper templates on the wrong side of your fabric. 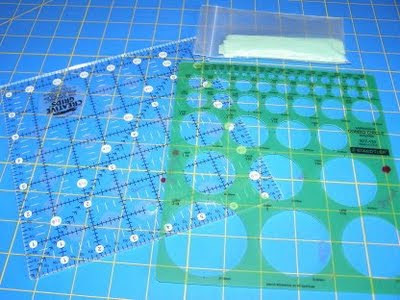 Lay a spacer between the two templates as shown. Press with a hot, dry iron--the freezer paper will stick to the fabric and the spacer will just lift off to be used again. 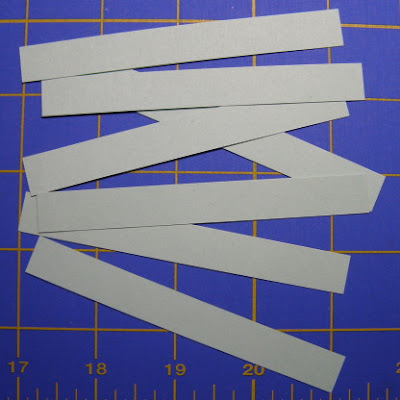 You can use multiple spacers if you'd like, so that you can position multiple pieces easily. The purpose of the spacers, you ask? When you rotary cut around the freezer paper, leaving a 1/4 inch seam, you only have to cut once to get perfect seams on both pieces. 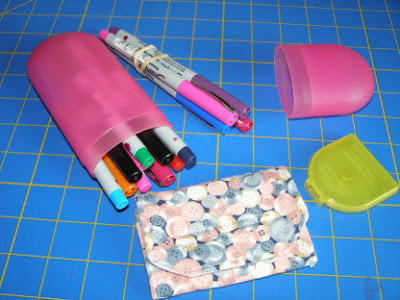 On this pic, notice that the 1/4 inch line on the ruler is lined up with the edge of the freezer paper. One cut, two seams! 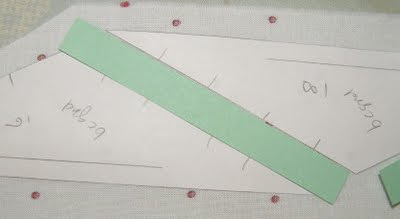 This shows the resultant fabric, marked for piecing and cut with perfect 1/4 inch seams using a rotary cutter and ruler. 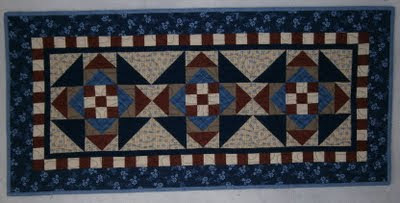 For tons of hand piecing tips, patterns, books and dvd's, visit www.lindafranz.com. She has also appeared on Simply Quilts and is the inventor of Inklingo--a method of marking fabric for hand or machine piecing using your ink jet printer. Check it out! And, of course, (okay, here comes the shameless self-advertisement), I offer hand piecing classes. You can check them out at www.sharonstroud.com. Okay, enough frivolity for this time. The butterfly bushes are not in bloom yet...but there is hope. 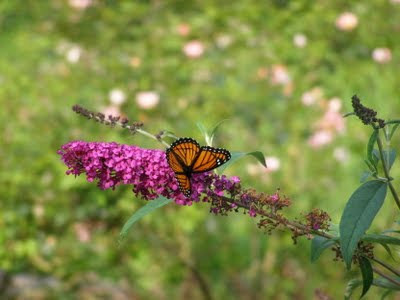 And I have seen the butterflies. P.S. 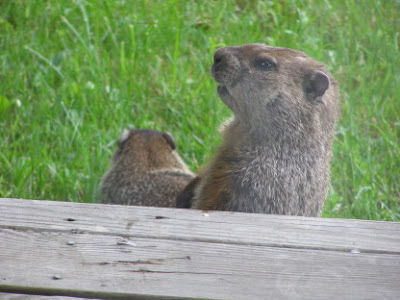 Kathleen, I will tell about the spacers tomorrow. But I use 1/4 inch masking tape and a ruler to mark any size grid--it lessens the chance of tape residue over a larger area. Yes, it's too big for a bag--it must go into a giant container! This is the 5.8 qt. Lock n Lock filled to the brim. I carry this to every hand class, and sometimes to others as well. Here we see it fully loaded. All the contents are now out of the box and on my cutting board. A pretty impressive array, eh? The smaller containers make it easy to find just what I want. Here's how it breaks down. The hand sewing kit has two kinds of needles, pins and cushion, extra pins in a box, an extra thimble, a bulldog clip (just in case? 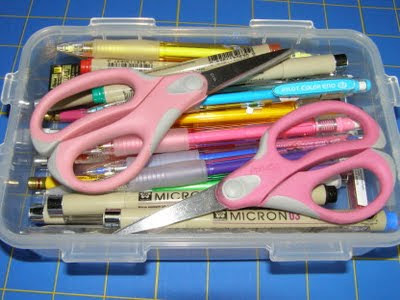 ), thread, a seam ripper, scissors, Thread Heaven, a used needle case, and a couple pieces of pink felt (just because). 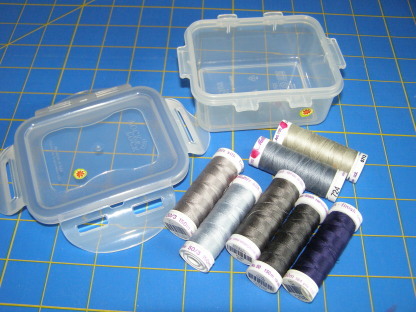 A slightly smaller box has seven spools of 50 wt. Mettler thread. Shades of gray, taupe and a navy. I can add others as needed. 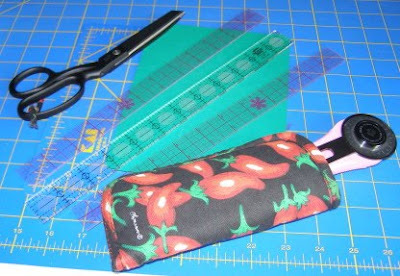 I have two small cutting boards that fit in the bottom of the bigger box (handy for rotary cutting for hand pieced blocks), big scissors, a 1 x 12 inch rotary ruler, two 1 x 12 inch C-Thru rulers for tracing and drafting, and a rotary cutter in a chile pepper case (a gift from a student). 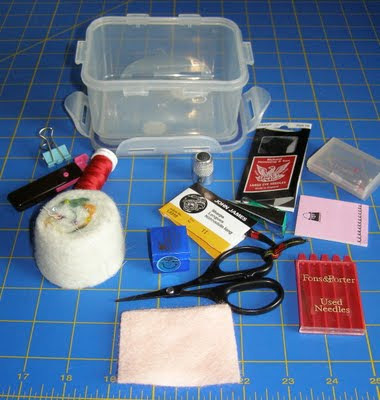 I also carry a 7.5 inch square ruler, two circle templates and the bag at the upper right is full of 1/2 inch spacers for hand piecing. Wow! That's a lot for such a small container! I know that a couple times I have forgotten it and am absolutely lost without it. 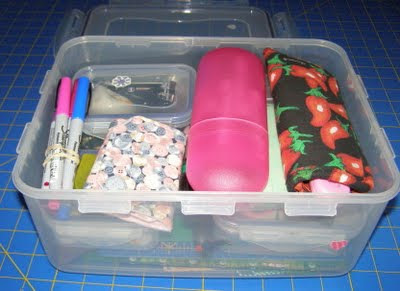 Because I only have one industrial size to-go container, I have to transfer it from one class bag to another as needed. I realized a couple days ago that I had never finished the to-go series--so now you know the rest of the story! Part of today was spent basting for classes and also a piece I had pin basted several months ago. And this evening I took my hand saw and loppers to two rather overgrown bushes in the yard. I know I heard each of the bushes breathe a sigh of relief to have so much weight off them. 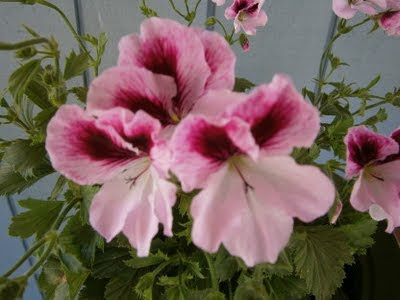 As I was deadheading my Martha Washington geranium this afternoon, I had a chance to take a really good look at it. 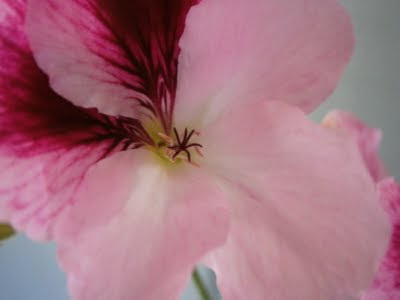 The patterning of the colors and the delicate details are just amazing. 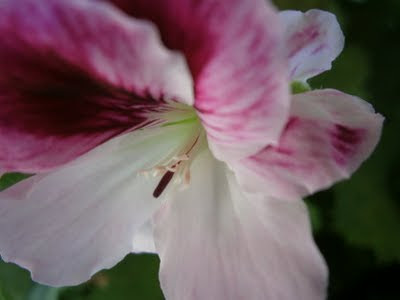 The stamen is almost star-like. But apparently starts out as a straight shoot. Can you believe those colors? 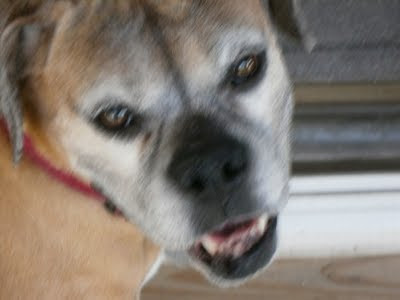 And Lynnie said she hadn't been on the blog in a bit--so here is her too cute face. I just love her to bits. Perhaps tomorrow will see something quilt related here. Unless I get distracted yet again! The perfect ending to a perfect weekend. Good food, family, friends, and weather that was hard to believe for so many days in a row. Hope your weekend was whatever you most desired. or am I looking at you? 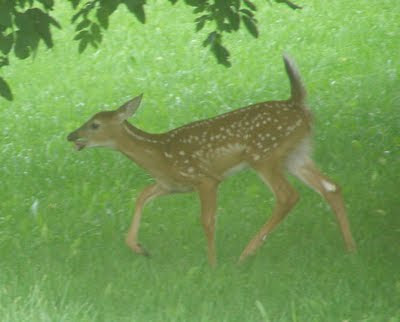 The fawn was quite a handful! Running and jumping in huge ovals around the birdbath, tree and its mother! She kept a good eye on her charge, but I think she was getting a bit weary. But who could resist this face? 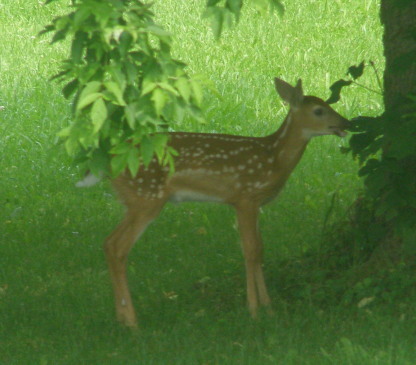 Taking time to smell...the leaves? One spot, two spot...how many spots do you think I have? And this is just precious! 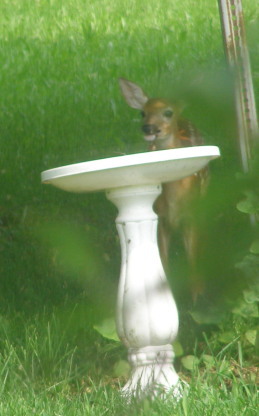 All the pics were taken through my kitchen window with a 10x telephoto lens. Are you all having a great weekend? Long time, no post, I know. Let's just say things are looking up and here I am with another finish. This is an Apple Creek Tablerunner. 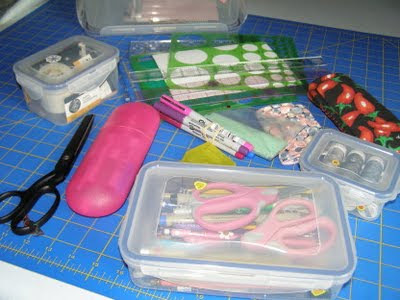 My friend Debbie gave me the kit for Christmas 2010 and I have it finished! Partly because Debbie machine quilted it for me! It's a delightful addition to my kitchen island. And here's a detail. The kit was from Connecting Threads. They were generous with fabric--working in fat quarters rather than smaller pieces that are not enough if you -- eek! -- make a mistake. The start of a long weekend for most. Half of 2011 is gone--so let's whoop it up for the second half! What's up next? You'll have to tune in tomorrow to see! P.S. I finished reading The Pioneer Woman by Ree Drummond. It was FABULOUS!!! A must read for everyone. I am simultaneously listening to Dark Horse by Tami Hoag and The Jungle by Clive Cussler and Jack DuBrul. Okay, it's really not simultaneously, even though I have two ears. One is on cassette and one is on CD. So one is done at home and one in the car. And I am enjoying both.